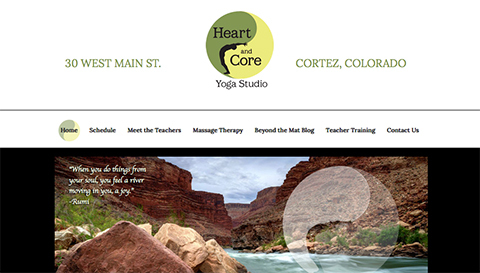 Tech-savvy business owner and Yoga Instructor Extraordinaire Jill Lawson uses her custom WordPress website to communicate news, schedule changes, and other timely info about the Heart and Core Yoga and Pilates Studio in Cortez, Colorado. Her Beyond the Mat blog keeps her students and fans informed and inspired AND drives traffic to her website. Her customized website framework makes it easy for her to stay in touch with her students and integrate her active online presence.